The flight performances I enjoyed the most at the 2009 Selfridge Air Show were the vintage aircraft. 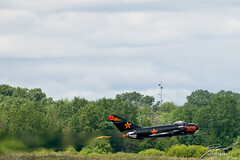 This Mikoyan-Gurevich MiG-17 Fresco put on quite the show, but even with the 70-300 on the D300 was often too far from the camera to get a good shot. Quite the interesting shot. Love the framing. I like the fumes. Nicely done.